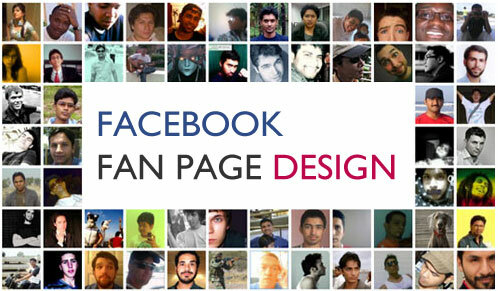 Customize Facebook Fan Page using FBML. Have you created Facebook fan page for your website or product? 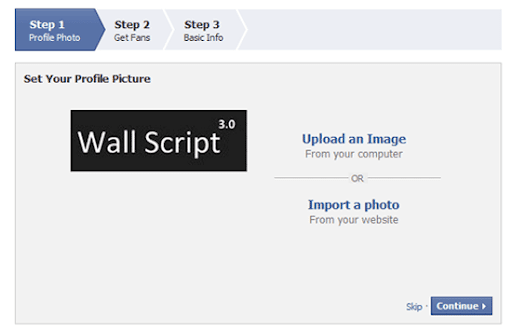 if not take a quick look at this post how to customize Facebook fan page with static FMBL. Fan pages helps your product will reach many more people. It’s very simple and it supports HTML tags, try this and market your product. Login into Facebook and click here to create a new facebook fan page and choose right category for your product. Fill the basic information about your product such as uploading images, title and description. Now the most important part in this cycle adding Static FBML application for customizing fan page. Click here you will find out the following screen and then select your page. Note: Static FBML application not working with old facebook accounts. Try with new facebook account. Open your page and find out and click Edit Page button top right-side. Editing Static FBML page. Apps -&gt; Added Apps and find out Static FBML application and click Go to App. Coding part first edit the Box Title(tab name) next paste your HTML code into following textbox. Using this condition you can check the user status liked or not? Hi <fb:userlink uid="loggedinuser" /&;gt; thank you for liking me. Following code helps you to include Vimeo.com videos in fan page. I love vimeo videos, rich quality and neat design. You have to replace video VIDEO_ID value. For adding Youtube.com videos. You have to replace video VIDEO_ID value. Adding slideshare.com presentations. You have to replace video DOC_ID value. Setting up default landing welcome page. Edit Page -&gt; Manage Permissions -&gt; Default landing tab. Click here to add second tab, Click Here to add third tab. 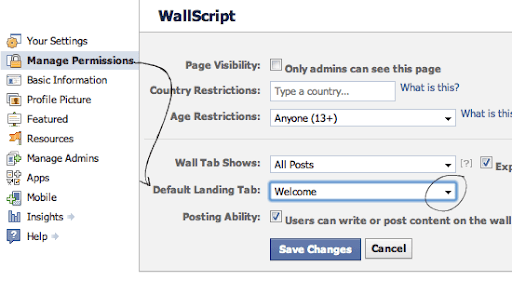 Adding Facebook like box for your website. Eg: Fan page URL: http://www.facebook.com/pages/WallScript/114512775303437. If you have unique Facebook fan page designs please post a comment here. Thanks! Thanks...but many website posted about this material. 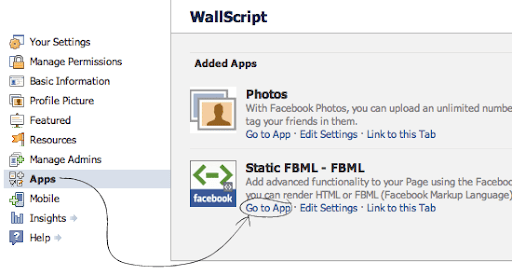 Now how to make Facebook Application, how to code for facebook aplication. Thanks.. I've been waiting for this hehe, thanks sir! Nice post. Soon i will also change my page. Yes, I think the same, the FMBL isn't using any more. How Can check the user status liked or not in Iframe? Static FBML working with new facebook accounts. I have created fresh fb account, now I'am able to access static FBML app(Safari browser). I am trying to use the iframe app, I have it on my site, but I'm lost as to how to create a nice welcome page using this. when will you write about how to create fb apps with 3 or 4 eg codes? can u post facebook chat application. This is a great share my friend. I can't wait to create my own fan page. I'm gonna try this for my page! Nice one! thank you but i cant find the Static FBML in my app page. Only; Event, photos, videos etc..
Nice tutorial but I cant find the Static FBML in my page. does it mean to use the FBML one must create a new facebook account?or is there a way to transition? 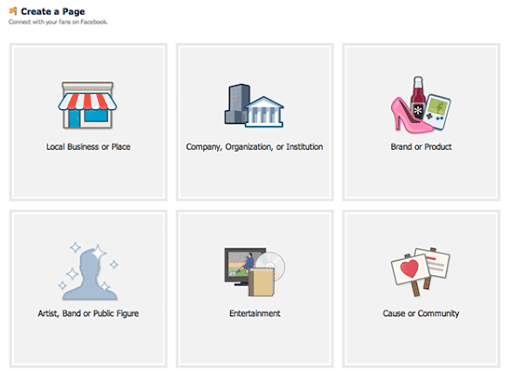 Great, these points are really very helpful to customize facebook fan page very easily. Do you know of anyone who can help me get this done. Hitting the wall. You have described an amazing way to customize facebook fan page. I have followed your blog post / tutorial to customize my facebook fan page.